This is our book (with incorporated CD) of lyrics and songs for children and adults. 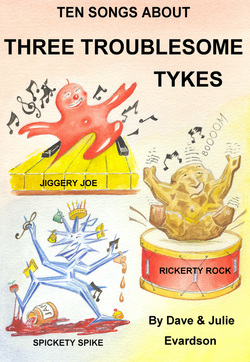 The Tykes are Jiggery Joe, Rickerty Rock and Spickety Spike. Their concerted aim is to spoil everyday life for young children. Jiggery Joe messes up your room, and strews the contents of cupboards across your bedroom floor, making it look as if you never tidied up as you promised your Mum you would. Rickerty Rock's speciality is in craftily changing the passage of time. So, when you're enjoying yourself, he makes the time fly by. But when things aren't so pleasant, he stretches it out to increase your misery. Finally Spickety Spike messes around with your food. He makes things that are bad for you really tasty so that you want more of them, while food that's good for you tastes really horrible! The Three Troublesome Tykes are altogether a very unsociable bunch! We hope parents (or grandparents) and children alike will have fun singing along with the ten songs on the CD. With Illustrations by Roger McKay this makes an ideal Christmas stocking filler!